As some of you may know, the Abacus Data team are cycling enthusiasts. Alex used to work at a major cycling retailer in Ottawa and is a trained bike fitter and mechanic. I’m not quite so talented when it comes to maintaining and adjusting bikes, nor do I have the knowledge of bike mechanics, but I love the sport nonetheless. For those of you who are in similar shoes, you have also been in cycling heaven. For three weeks each year, the the professional cycling peloton goes up and down France in the Tour de France. This year’s race was one for the ages. It was exciting, unpredictable, and came down to the last stage. You cannot ask for anything more. Thomas Voeckler of France held the yellow jersey for 10 days and fought brilliantly to keep it through most of the mountains. Brothers Andy and Frank Schleck finished 2nd and 3rd respectively giving Andy his third 2nd place finish at the TdF. He will win one day no doubt – quite possibly next year. Cadel Evans from Australia won the yellow jersey (the rider with the shortest overall time wears a yellow jersey) and is the first Australian to win the Tour de France. Cadel had come second in the TdF twice earlier in his career. He’s a favourite of the peloton, a hard worker, and deserves the win. His win is great news for the sport as it continues to struggle with doping allegations related to past TdF winners Alberto Contador and Lance Armstrong. I know I have to wait over 330 days until the next edition of the Tour de France begins. For cycling nuts, we don’t have to wait too long for our next fix as the final grand tour, the Vuelta d’Espange (Tour of Spain), begins in August. Here in Canada, there are two UCI Pro Tour races in Quebec City and Montreal in September. I watched the race in Montreal last year – it was an awesome venue and great place to watch some of the world’s greatest athletes fight it out for the win. I’m looking forward to going again. 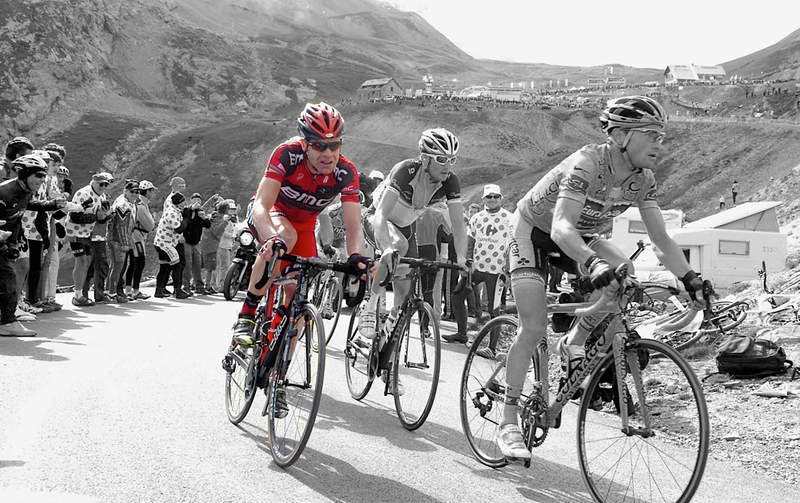 Cadel Evans, winner for the 2011 TdF, in his red BMC Racing jersey.